Search ALL Homes For Sale Here!! Hello and welcome to my Heidi Herda Real Estate blog! I hope you will find this site useful regardless if you are buying or selling or both! I am thrilled to start the most amazing journey with you and I'm glad you picked me! Customer service is key to my business as I would expect top notch service if I was in your shoes! I'm willing to go over and above to make sure that your home sells for the most money possible or, you find the perfect fit for your new home. Heidi Herda Realtor wants to give back! 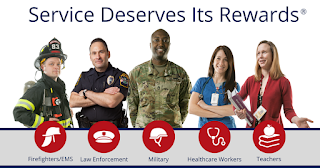 If you're a service member, firefighter, Police Officer, Healthcare Work or Teacher... I want to THANK YOU for your service to our Community! When you decide to buy, sell, or refinance, you have the opportunity to save big! I was first licensed in 2006 and had the great pleasure to assist on several successful Real Estate Teams at Remax Results as well as Keller Williams. I have enjoyed working every aspect of the Real Estate industry representing sellers, buyers, banks, and home owner’s seeking a short sale. In 2008, I received a Bachelor’s Degree in Creative Marketing, a discipline that involved the combination of Marketing and Graphic Design. I enjoy combining my Real Estate Team experience with her high energy, out of the box marketing and creative service in every detail of your Real Estate Transaction. I currently reside in the North Metro area of Champlin with my husband and kids. I come from a family of Realtor's as my Mom, Brenda Doebber has just joined the team as an exclusive buyer's agent. Brenda is detail oriented and focused on making sure your home is the right fit for you. Please get in contact with any of our staff at The Herda Home Team - 612.807.4858. My mission statement is to provide a one of a kind level of service, a high level of honesty, integrity, education, and understanding of the Real Estate transaction and processes to ensure you receive the best possible Real Estate outcome. To grow a Real Estate Team, of family that not only provides outstanding service but are passionate about Real Estate, marketing and will seek out the latest and greatest technology to improve your Real Estate experience. My values include honesty, care and commitment to not only doing the right thing but the right and best thing for my clients. I believe in love, passion, the golden rule and treating my clients how I would wish to be treated. I believe every client should be treated with the utmost care and compassion and deserves my/our full attention, excellent communication, out of the box marketing and a total commitment to customer service. If you're interested in a market analysis or just want to know how to get started buying a home or selling a home, feel free to contact her! Heidi is a true professional in every sense of the words - she is committed from the time you list until the time she finds you a new home. Truly driven by her commitments... She knows her business inside and out - and is always looking out for your best interest. I can't imagine ever buying another house without her. "Heidi gets the job done. As our selling agent, Heidi went above-and-beyond to make sure our home was properly represented. She worked tirelessly with our renter to make sure "all is well". She always took my calls and returned my text messages. She was there every step of the way! If you need someone who will work for you, then Heidi Herda is who you should call!"